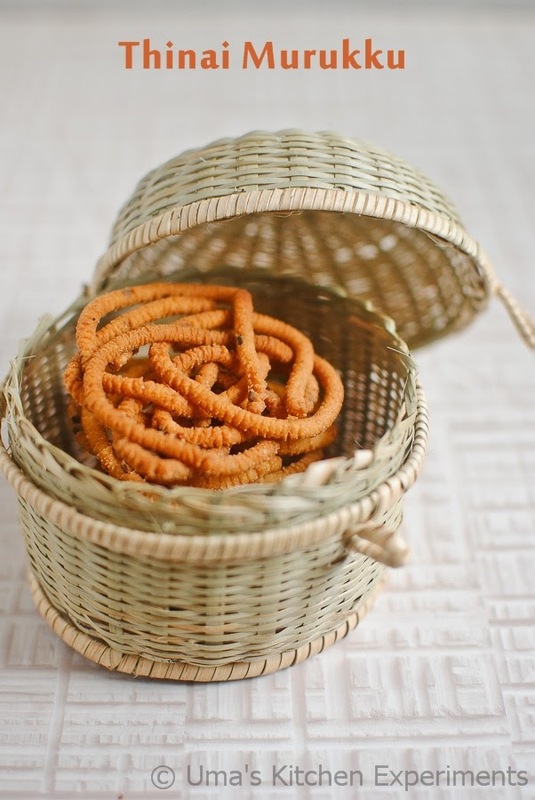 Do you have any murukku lover at your home? Well, I have one back at home, when I ask this question. 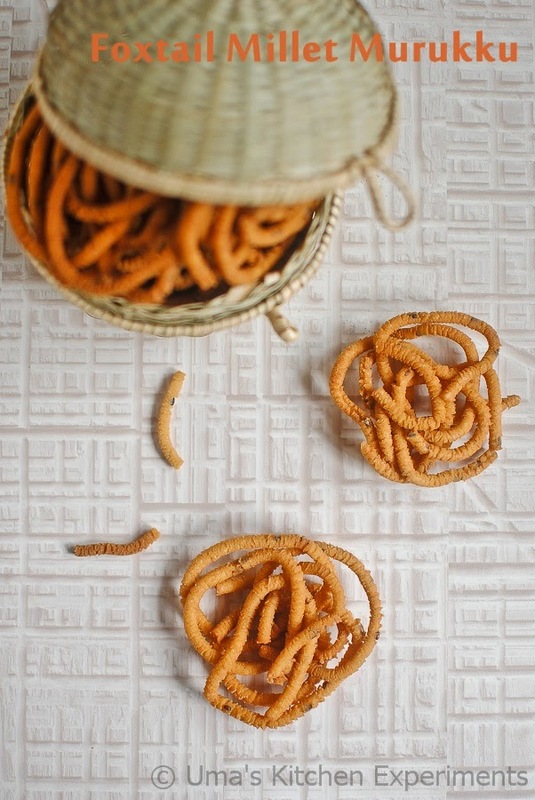 My mom, MIL or whoever know my husband in my relatives circle, make loads of murukku for him. Be it Diwali or Gokulashtami, Murukku must make an entry for him. My mom suggests me every time to make health stuffs in my diet even stands on his side and ask me to do or at worst case, she prepares and send him the parcel. 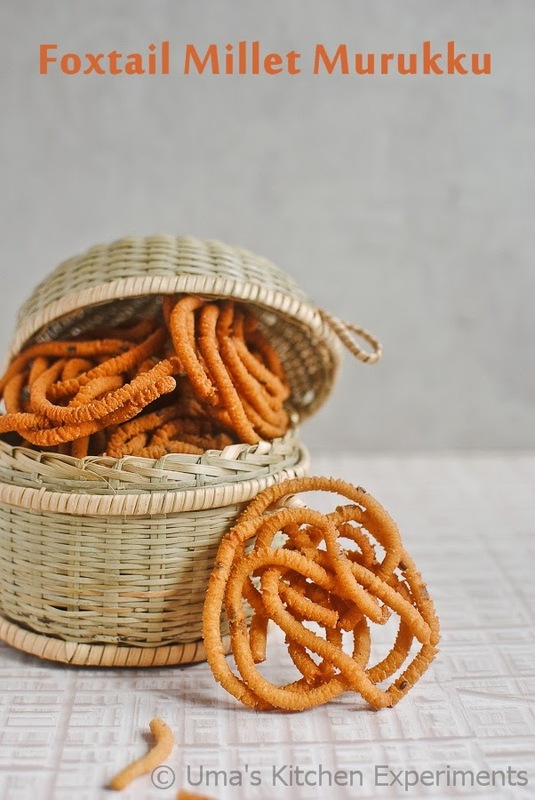 When I was a kid, though I used to involve myself in murukku or palakaram making process usually a day before Diwali, I never got a chance to fry the murukku as my grandma takes care of it citing safety reasons due to the hot oil pan. I don't get such a help now. If I ask my husband, he runs away from the kitchen immediately citing various excuses, but he is the first one to come and finish it after it is prepared. This is one of the reason I started trying various murukku recipes in small quantities, easy to make, less work load and good to store. Such an attempt was made during the Gokulastami day. I prepared Foxtail millet murukku ( Foxtail millet - Thinai in Tamil) as per my mom's idea. The first fried batch was tasted by my husband and he said there was no major difference is taste between the thinai murukku and the normal murukku made out of rice. Really there isn't! I made another batch couple of days before. That is what you see here as a Diwali recipe. 1) In a medium size mixing bowl, take foxtail millet flour and urad dal flour. I used the store bought foxtail millet flour and homemade urad dal powder. 2) Add cumin seeds, black seame seeds, salt and asafoetida. Mix well. 3) Add the water slowly in batches and make smooth, soft dough. For me, it took 3/4 cup of water exactly. It varies based on the flour you use. 4) Heat oil in a kadai or pan. when the oil hot and not smoking, take 2 teaspoons of hot oil from it to the dough and knead it to incorporate it. Make sure to simmer the oil after this till you are ready to fry the murukku. 5) Then, Choose the tri-hole plate in the idiyappam or murukku press, fill it with dough and make murukkus by pressing it to a circular motion without taking your hand. 6) After pressing, slide the murukkus to the hot oil and deep fry them in medium to high flame until the bubbles sound (shh sound) suppresses. At a time you can fry 3-4 or based on the frying pan and murukku size. 7) Remove from the oil and put them in a colander to drain the excess oil if any. You can either use kitchen tissue to absorb the excess oil. 8) Repeat the same procedure for making remaining murukkus. 9) Cool down the murukkus to room temperature and store it in a air tight container. 10) Serve them with hot tea or coffee. 1) For homemade Foxtail Millet flour, dry roast the foxtail millet, cool down and grind it to a smooth powder. For homemade urad dal flour, dry roast the urad dal till it becomes golden brown, cool down and grind it to a powder. After making the powder, measure in cups and use in this recipe. 2) Unless the normal murukku, foxtail millet murukku cooks faster. So, make sure to fry it without burning. Hi Sangeetha, Thanks a lot. That is mica sheet. Sandhya Hariharan, Thanks a lot. I got it from Rajasthani Handloom expo here in India. 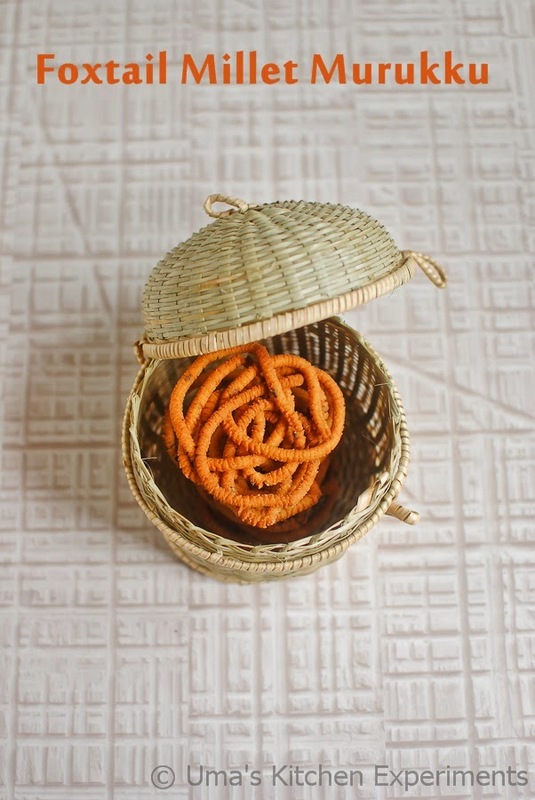 Wow, that basket is damn cute.. Beautiful prop Uma.. Crunchy munchy murukkus looks too tempting.